David Rago Auctions held several sales this past weekend, including some that were single-owner. Some interesting results for glass and lamps were achieved (the only areas that I cover). One single-owner sale from New Jersey was entitled Una Buona Vita. 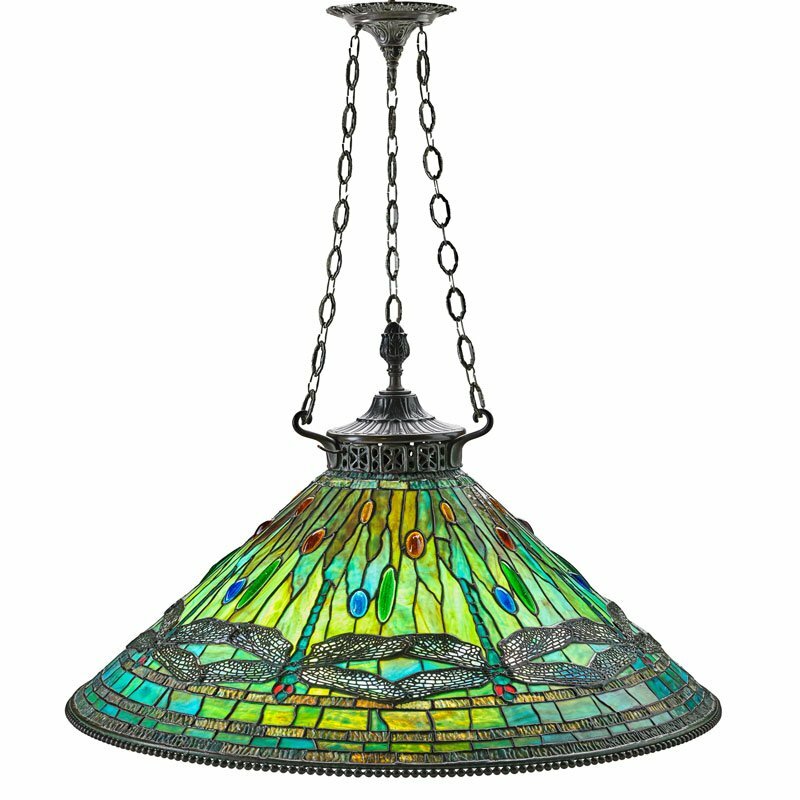 It began with Tiffany lamps, including the cover lot, a 28″ diameter Dragonfly chandelier. It sold within its pre-sale estimated range of $75,000 – $100,000, realizing $100,000, including buyer’s premium. In the same sale, an Argy-Rousseau pâte-de-verre Papyrus vase sold well beyond its pre-sale estimate of $2,000 – $3,000, realizing $15,000, including buyer’s premium. 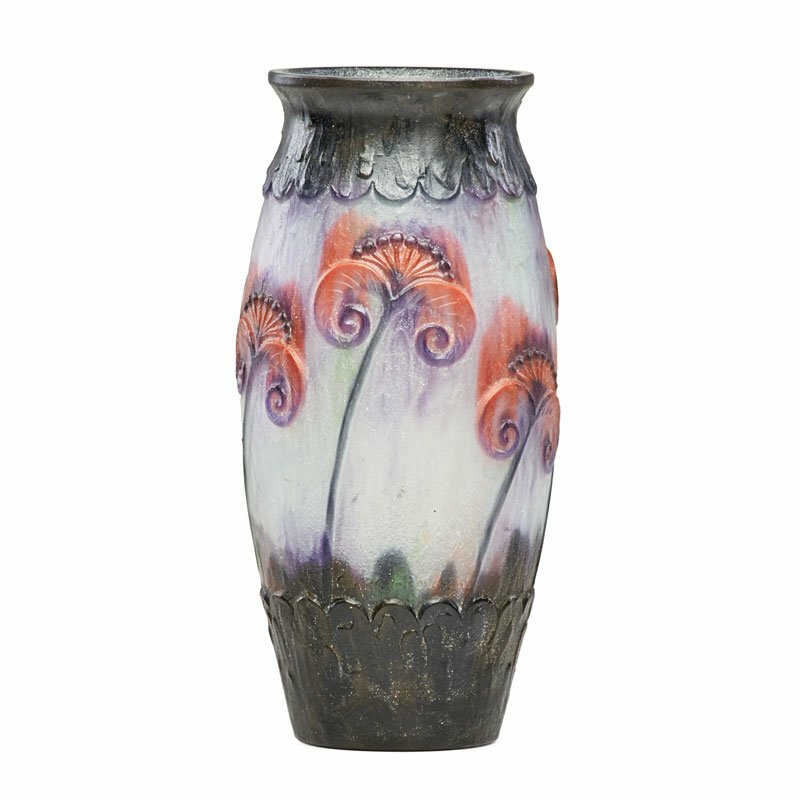 The estimate was intentionally low because the vase had a restored drill hole in the base. There’s going to be one unhappy buyer if they didn’t know. 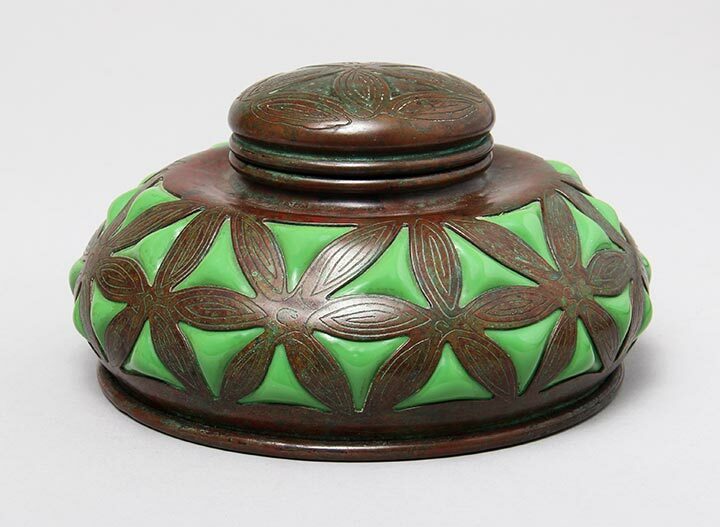 The most interesting result of the Saturday Early 20th Century Design sale was lot #468, a beautifully wheel-carved vase with a grasshopper and fancy engraving underneath, including “Emile Gallé fct 1895”. 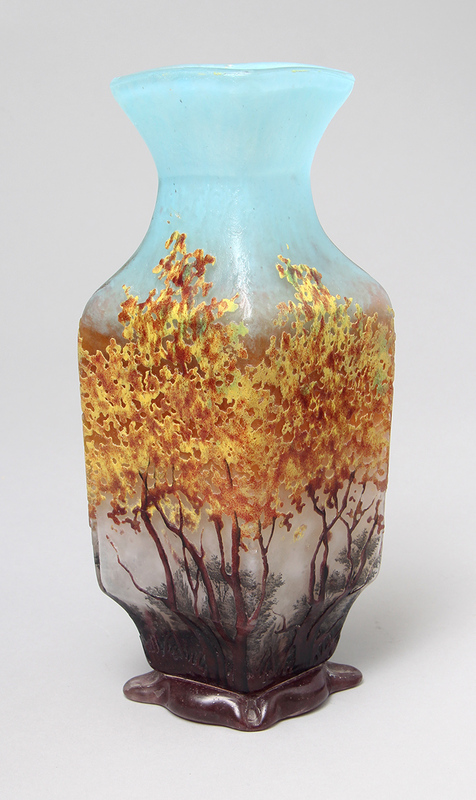 I haven’t been able to figure out exactly who made this vase, nor if it was actually made at the Gallé factory. 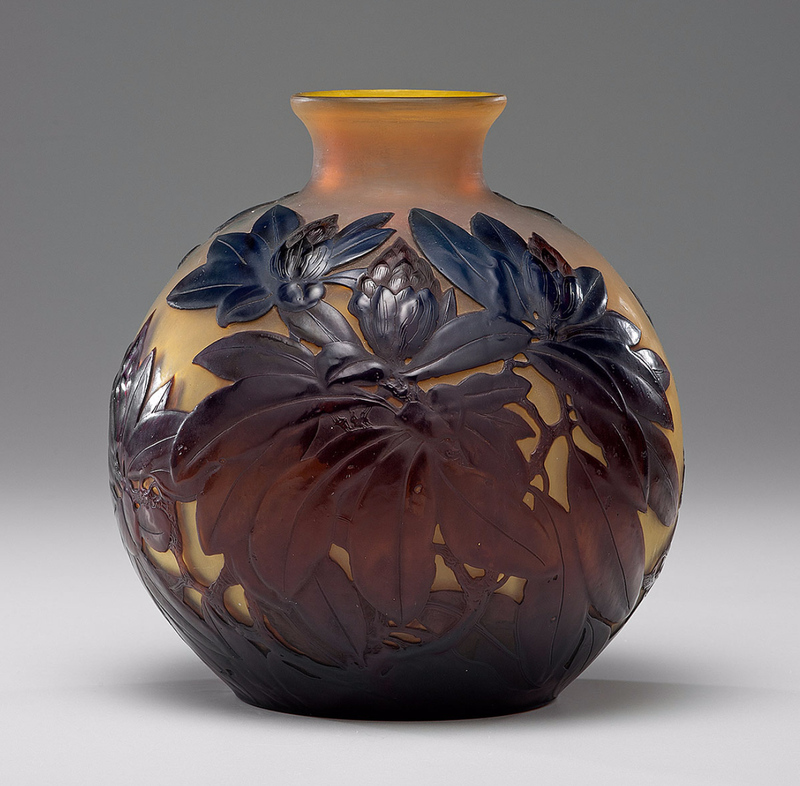 Rago attributed the vase to J. Jacquemard, who possibly did it while working at Gallé. Regardless of my lack of knowledge, the bidding was very active, allowing this grasshopper to jump to a final price of $37,500, including buyer’s premium, against a pre-sale estimate of $9,000 – $12,000. For the results of the various sales, click here. 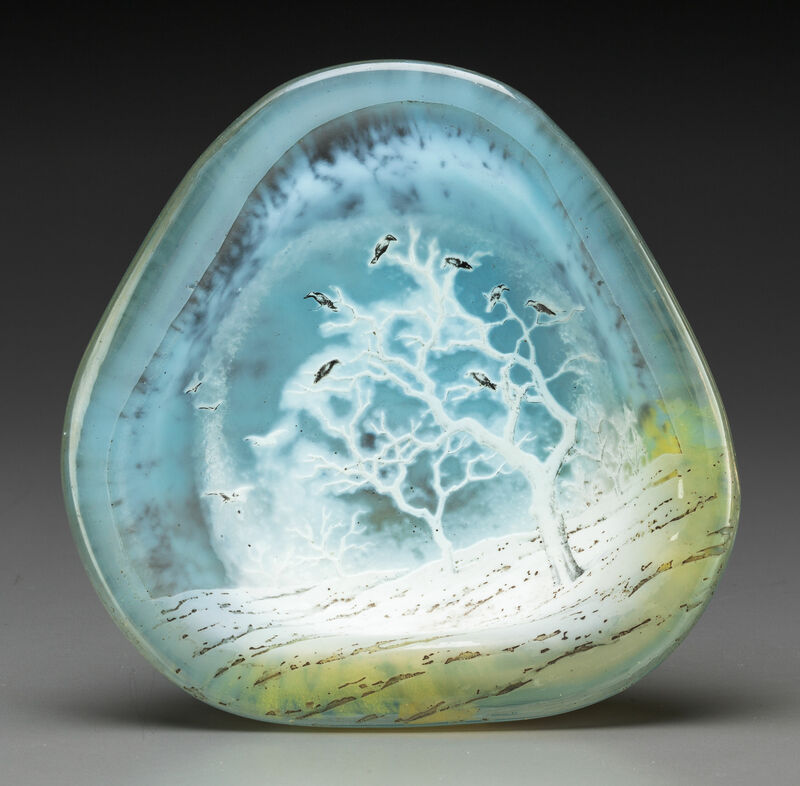 French cameo glass was sold at a couple of auction houses recently with opposite results. Here’s a rundown of them both. 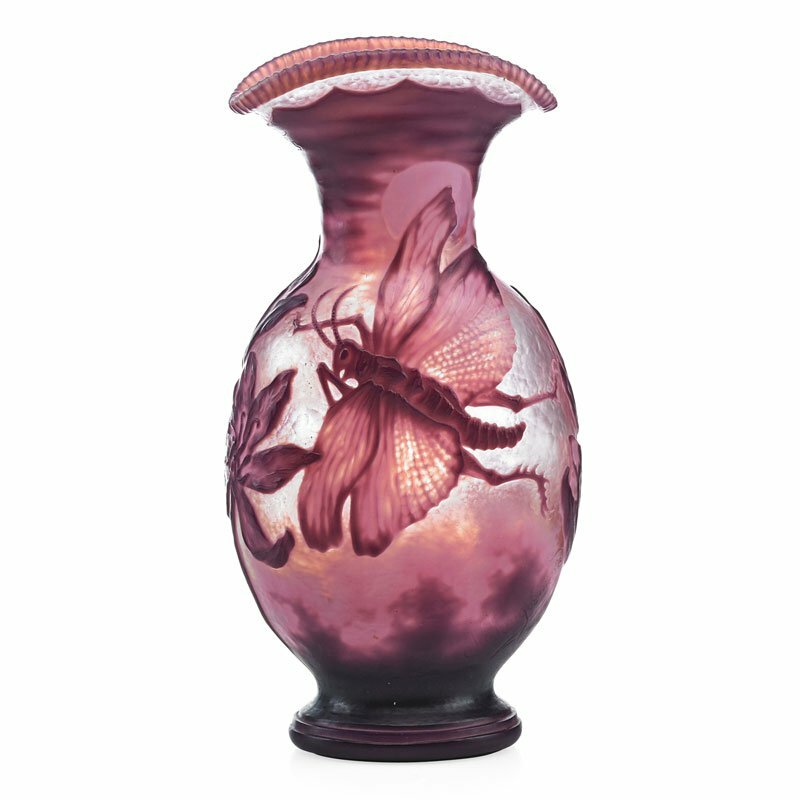 Cowan’s Auction, Cincinnati, OH, sold a moderately rare Gallé blownout Rhododendron vase at their Decorative Art: Live Salesroom auction on February 13, 2016. 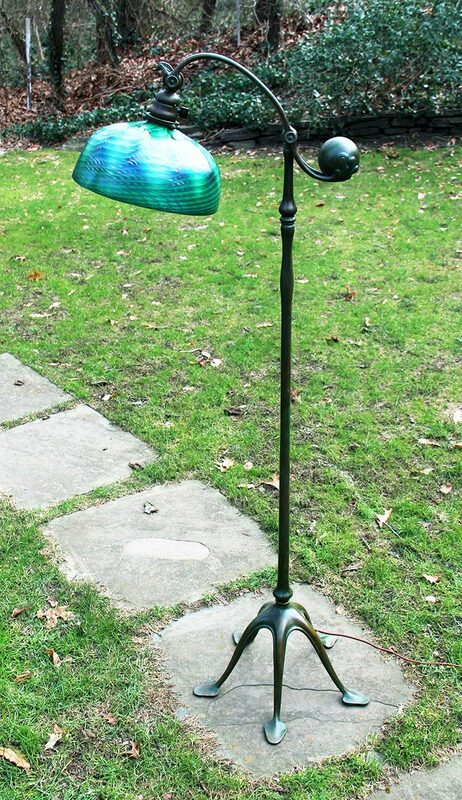 Estimated to sell for $3,000 – $5,000, it soared to $18,600 including buyer’s premium. Heritage Auction, Dallas, TX, sold a rare Daum Blackbird tray for only $1,062.50, against a pre-sale estimate of $700 – $900. The condition report stated “Lightly polished chips to the exterior and interior of the lip rim, light scuffing to the underside.”, which probably hurt its sale. The lot was hidden in the back of the catalog of the Fine & Decorative Arts Including Estates Signature Auction sale of February 20-22, 2016. I knew about the lot, and was going to bid on it, but didn’t. I missed it because I was too busy at my shows. Too bad for me, kudos to the winner. Our next show is not until April 15th, when we’ll be at the Chicago Botanic Garden, in Glencoe, IL, for the Garden, Antique & Design Show. It’s one of our two remaining shows in the greater Chicago area. We really like exhibiting in Chicago and look forward to seeing all of our old friends. 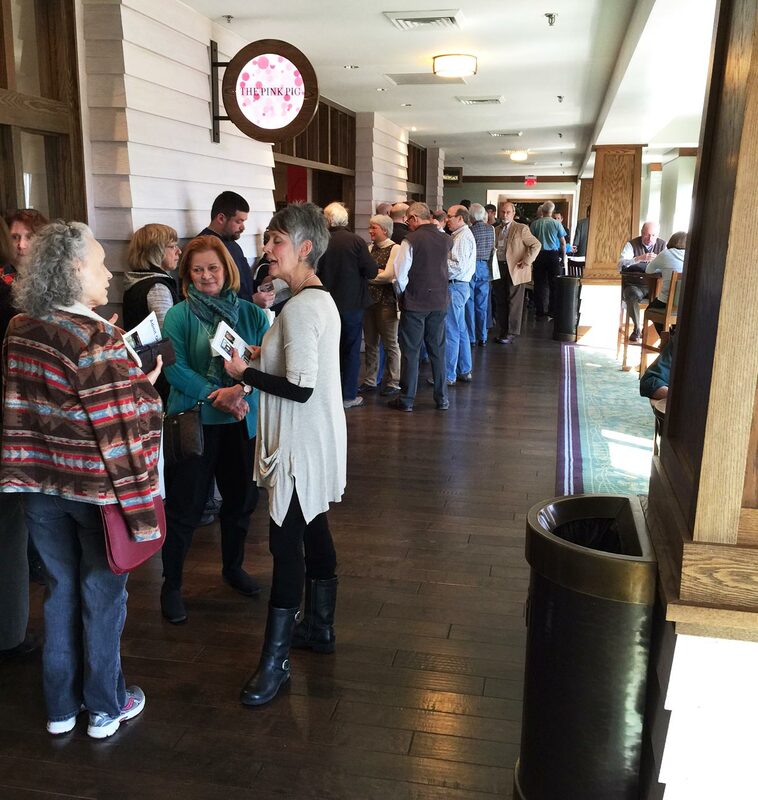 The National Arts & Crafts Conference at the Grove Park Inn in Asheville, NC, closed yesterday, after a three-day run from February 19-21. 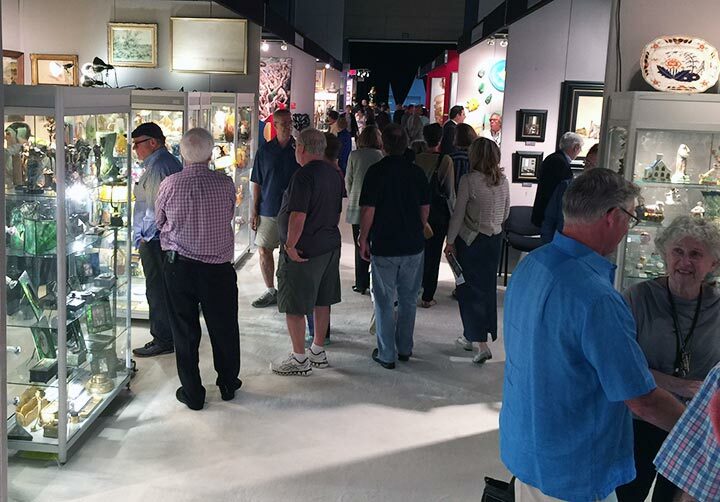 The show was very well attended with enthusiastic, knowledgeable collectors. It’s an event, not just a show. The audience is captive while staying at the resort and spends more than the usual amount of time participating in the show and associated lectures and tours on the Arts & Crafts movement in the United States. 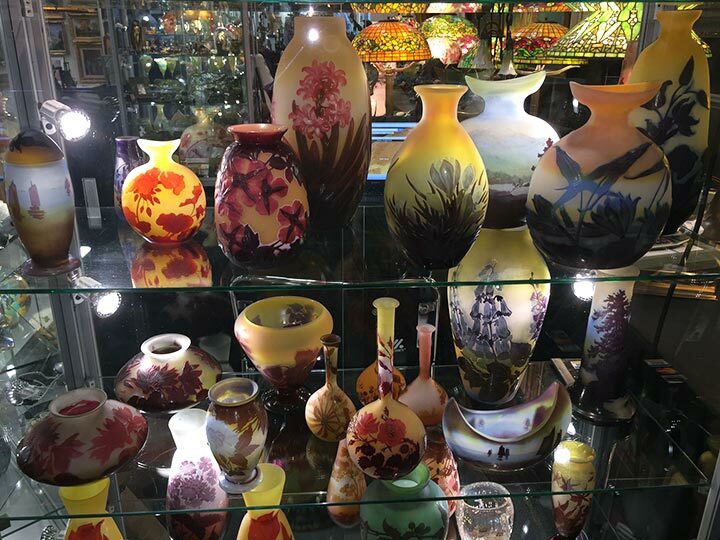 The show is different than most others in that it’s divided into an antiques section and a crafts section. There’s no mixing of the two, so attendees are clear who’s who. We sold in three days almost exactly what we sold last week at the impossibly long, 6-day, Palm Beach Jewelry, Art & Antique Show, but this time we made a profit because of our expenses were much lower. It’s a fun show, in a glorious, historic hotel. Put it on your calendar for a visit next year. You’ll thank me. 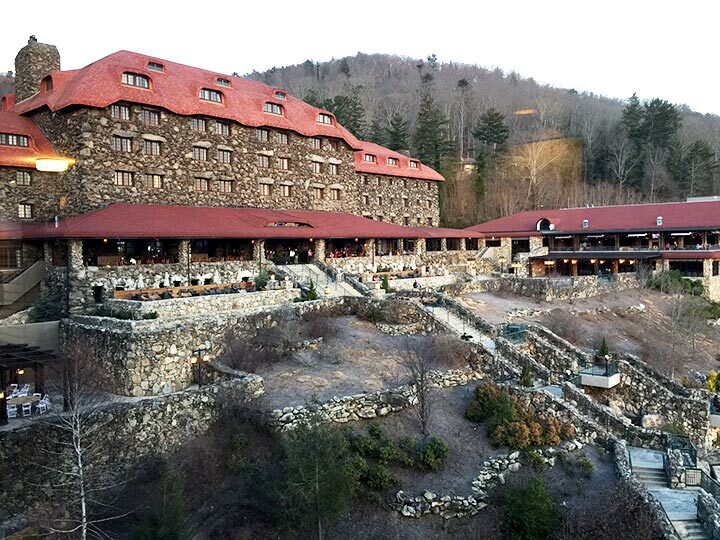 Hello from the Grove Park Inn in Asheville, NC, where we’ll be opening the National Arts & Crafts Conference tomorrow. 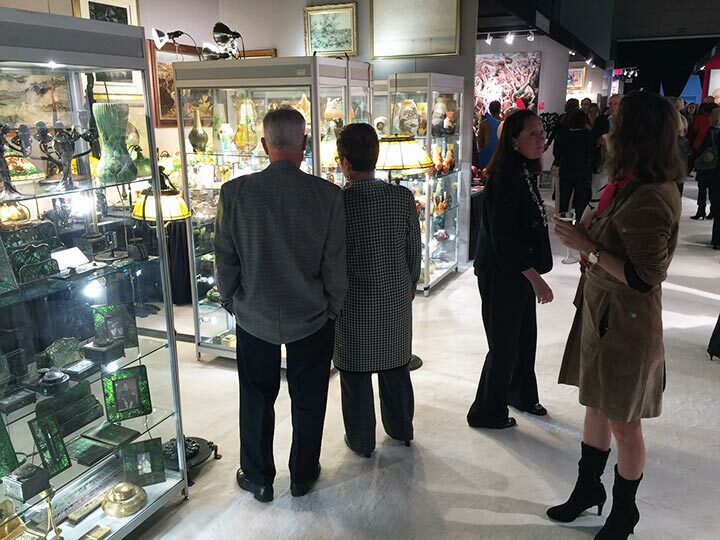 The Palm Beach Jewelry, Art & Antique Show finished Tuesday with a whimper, not a bang. We made a couple of small sales the last two days, but we still finished with a loss. Lots of time, effort and money, with no reward. The show attracted many attendees partly because the PBSG gave out thousands of free tickets, but also because they did a good job of advertising. The problem was the show attracted thousands of the wrong people. 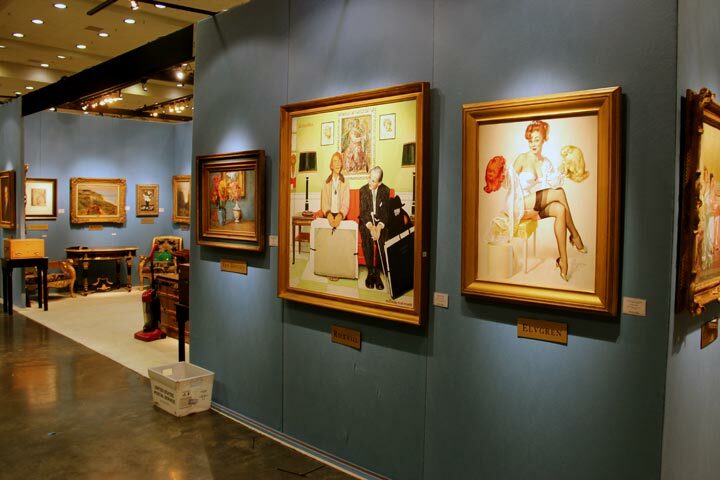 The purpose of spending a lot of money to exhibit at a fancy show in a wealthy neighborhood is to attract qualified buyers, but that didn’t happen. This is the second year in a row that we either failed to make expenses or barely eked out a profit. Extending the show to six days made the problem worse. I can think of much better ways to spend my time and money. Unfortunately the expenses killed my show. Remember I took a smaller booth to trim my expenses. Good thing I did or I would have had an even larger loss. The business of exhibiting at shows has become really tough. As a result, we will not be exhibiting in Palm Beach next year. Many shows have failed, or will fail soon, leaving very few where we can make a profit. I’ll be beefing up my Internet presence in the hope of attracting new clients. If that works out well, there will be even less incentive to travel to marginal shows. 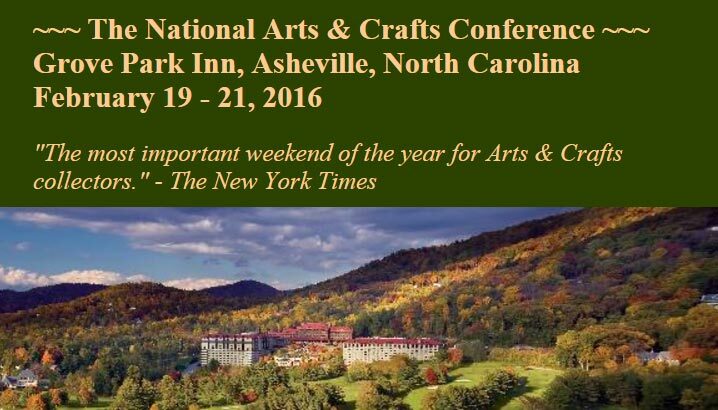 Mondays blog will have the results of the National Arts & Crafts Conference in Asheville, NC. 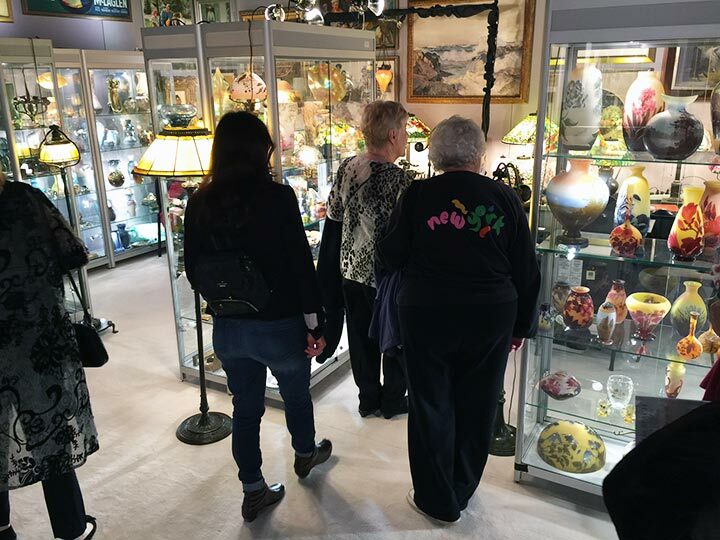 The Palm Beach Jewelry, Art & Antique Show has been open to the public since last Thursday and will remain open until tomorrow, Tuesday, at 6 PM. Following is a contemporaneous account of the show. The show started with very few people, probably because there were so many attendees the previous night at the preview party. It got more crowded as the day progressed, but the quality of the inquiries has been poor. No sales. One potential sale. The first day is over and it’s been quite disappointing. Only one small sale. Attendance petered out later in the day. Hopefully things will improve or this show will result in a loss of both time and money. Surprisingly, attendance seems better today than opening day. The quality of the inquiries has been better and there’s hope for some sales later in the day, but none as of now. Strange day. Didn’t work out at all the way I thought it would. None of the early clients returned to make a purchase. However, one of my clients who hasn’t purchased anything in a few years made a special trip to visit the show and made a major purchase. So the day ended well. It’s still scary that we’ve made only two total sales. 4 PM Saturday. That’s my booth on the left. Attendance has been good, but not with the right people. Too many people are looking to appraise their own items and are not interested in purchasing. A man who spent 30 minutes with us yesterday because he was “interested” in a bronze, came in today to tell me he disagrees with my attribution of the artist and showed me photos of his identical bronze. Give me a break! Some people are clueless. What a depressing day. Lots of people walking by, but nobody serious. 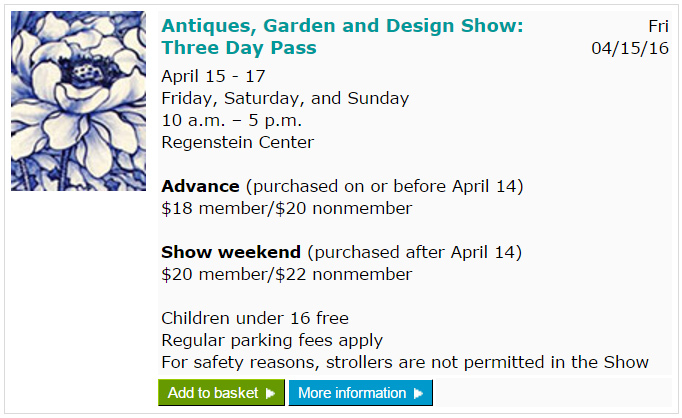 PBSG gives out thousands and thousands of free tickets, so why not come and visit a prestigious antique show if you don’t have to pay? Great for the public. Awful for the exhibitors. Attendance is better today than any previous day. We’ve had some good early interest, but so far everyone is a “be back”. Hopefully this day will end better. The show clouds parted and the sun shone. Thank goodness we finally had a decent day. We still haven’t made our expenses, but at least it’s not a disaster. You still have until tomorrow to visit the show. Please accept two free tickets by clicking on the image below. Tune in Thursday for the final results. The National Arts & Crafts Conference will run from February 19-21. It’s a beautiful show in an amazing 1910 historic hotel. The focus is Arts & Crafts, both antique and new. It’s a very pleasant show that we enjoy doing. Attendees fly in from all over the US. 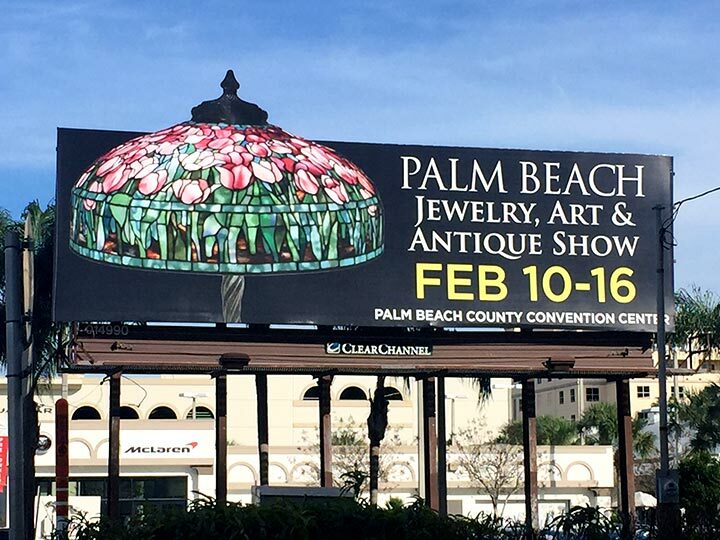 The Palm Beach Jewelry, Art & Antique Show will open to the public today, Thursday, February 11, 2016, at 11 AM and close on Tuesday at 6 PM, for a total of six days. I’m writing to you now from the preview party on Wednesday night. It’s 7:30 PM and the show is crowded. There have been a few inquiries, but no sales. It’s possible some of the inquiries were serious, but it’s too soon to tell. We’re jammed into a small booth because I wanted to trim my expenses. Not sure if that was smart or dumb. There’s no room to move and the booth is very crowded with merchandise. I’ll let you know later if I did the right thing. I have to hand it to the Palm Beach Show Group. The show is really fantastic, with some of the most beautiful displays you’ll ever see. The exhibitors are the best of the best, with museum-quality displays. The whole look of the show is a cut above most shows you’ll see anywhere. The show runs a day longer this year, so you have six full days to visit. It’s worth a trip from anywhere. Please accept two free tickets to the show by clicking on the image below. 9:30 PM update No sales. What else is new for a preview party? Hope the rest of the show is good. Tune in Monday for an update on the show’s progress (which I hope will be a good report). The final results will be published next Thursday when we’ll already be in Asheville, NC, setting up at the National Arts & Crafts Conference. 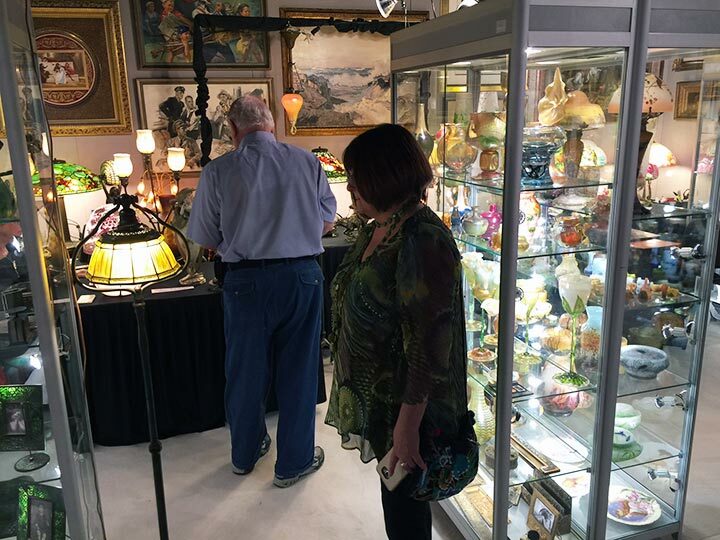 The Palm Beach Jewelry, Art & Antique Show will open to the public this Thursday at 11 AM and close on Tuesday at 6 PM, for a total of six days. Personally I think the extra day is a mistake, but I hope to eat my words when I give you the results of the show next week. If you’ve never visited this show, it’s stunning. 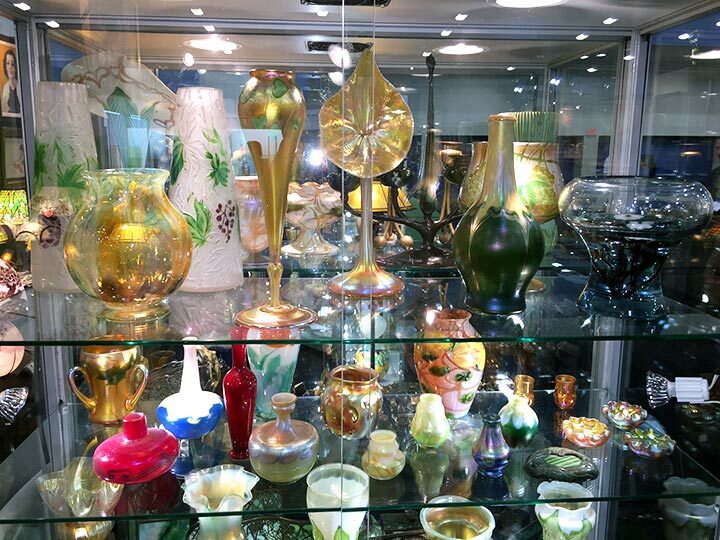 The exhibitors are the best of the best, with truly impressive, museum-quality displays. It’s smaller than the Original Miami Beach Antique Show, but higher quality. Don’t get me wrong. It’s not small, just smaller than the huge Miami Beach Show. It’s worth a trip from anywhere. As a small incentive, please accept two free tickets to the show by clicking on the image below. This Thursday’s blog will follow the preview party on Wednesday night, while next Monday’s blog will be an update on the show’s progress. The final results will be published next Thursday when we’ll already be in Asheville, NC, setting up at the National Arts & Crafts Conference. 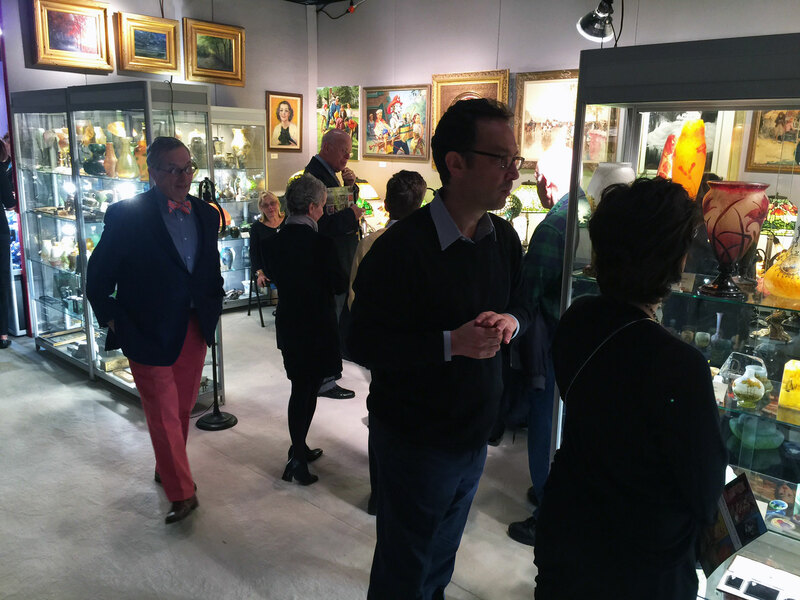 The Original Miami Beach Antique Show ended yesterday, February 1, 2016, after a five-day run. The show went well for many dealers, but more than a few did poorly. The results seemed hit or miss. Opening day for us was decent. We made several sales, but the total was slightly disappointing. That wasn’t unusual for opening day. We usually did better the next day, Friday, but not this time. Lots of tire kickers and only a little business. The rest of the show wasn’t substantially better for us. A few sales, but an overall disappointing result. I did make sales by doing my homework. I emailed photos of good items I found at the show to my best clients and they bought. You know who you are. Thank you! Now for some of the scuttlebutt on next year’s show. 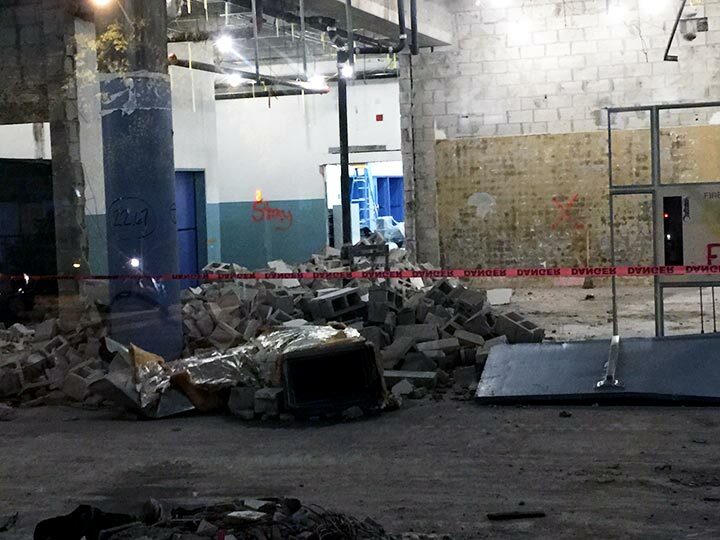 The construction at the Miami Beach Convention Center is underway and will take at least until mid-2018. That means the Original Miami Beach Antique Show will surely not return to the Convention Center in 2017 and 2018. After that it gets interesting. There’s no guarantee US Antique Shows will be invited back. The City of Miami Beach only wants shows they deem important to the local economy. If they don’t think the Original Miami Beach Antique Show brings in enough revenue to the city, they will not be invited back. If I were a betting man, I would bet against the invitation. If I’m correct, this was the last antique show at the Convention Center, ever. Ugh! 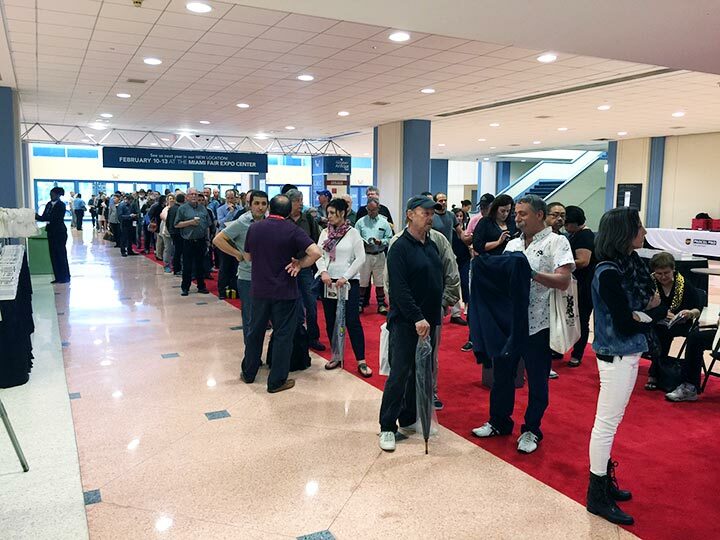 It looks like many dealers will be jumping ship and not exhibiting at the new location for the show, the Miami-Dade Fair Expo Center. I’ve heard that many of these dealers will instead exhibit at Dolphin Fair’s new Miami Airport Show, the week before. If you remember, that show used to be huge, with exhibitors filling two floors. Now it looks like that show is growing again and could eventually eclipse the Original Miami Beach Antique Show. What a turn of events that would be! But that story is still to be written. Tune in for updates. There will not be a new blog this Thursday. We’re leaving for the Caribbean for a week on a well-deserved vacation. 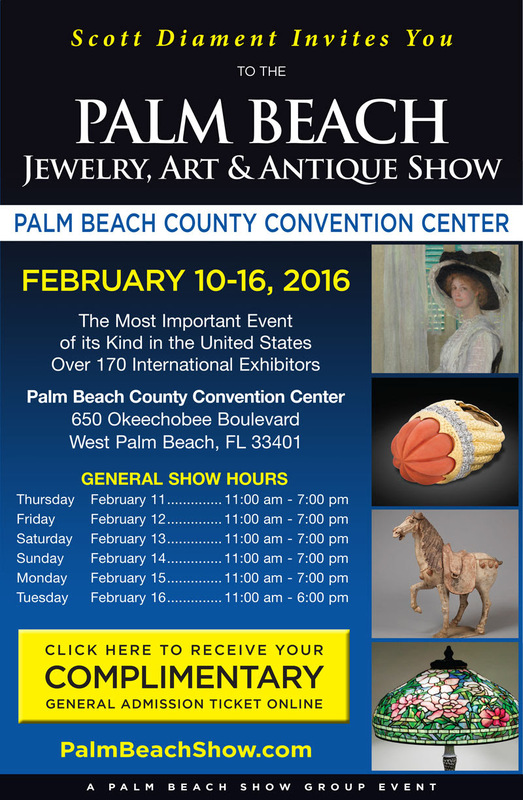 We’ll see you the following week at the Palm Beach Jewelry, Art & Antique Show.